From birthdays to anniversaries to bar mitzvahs, there are dozens of occasions that call for a card. And with a store-bought card costing upwards of $3 a pop, those happy celebrations can put a sad dent in your wallet. Why not make a card yourself, creating a personalized gift while saving some money in the process? With fancy moving and pop-up parts, a homemade card will show that you care enough to make the very best. Think about the recipient of your card and tailor the style to her. A Mother's Day card will have a different tone than one for a 5-year-old's birthday. Fold a piece of construction paper in half. With a marker, add a message on the front that fits the occasion ("Congratulations" or "Happy Anniversary," for example). Determine what images you would like to decorate your card. They could be flowers, cars, ballerinas or whatever matches the theme and occasion of the card. Draw these images on a separate piece of construction paper and color them in. Alternatively, you could print images from the Internet. Cut out these images. Cut a strip of construction paper 4 inches long and 1 inch wide for each image you have. Fold the strips like an accordion into 1-inch squares. Glue one end of a strip to the back of the cut-out image, and glue the other end to an appropriate place on your card. Putting the images on the inside will make them pop out when the recipient opens the card. 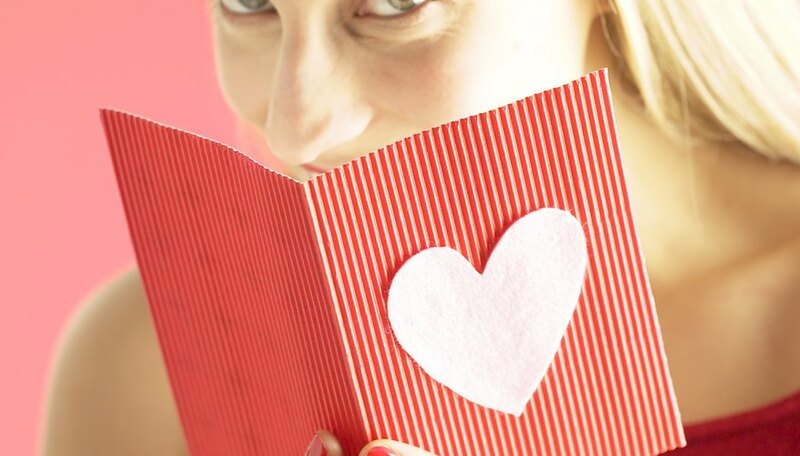 Finish with a clever or heartfelt message on the inside of the card. Don't forget to sign it and add the date, so the recipient can remember when he or she received this homemade gift.